Five men are prepared for execution by hanging in Velizh, Smolensk Oblast, Soviet Union, in September 1941. This was one of a series photos recovered from a dead German soldier and published in Pravda on June 2, 1942. Velizh contained 1,800 Jews before the war; by the time the Germans arrived in August 1941, some 1,500 remained. The day the Germans arrived, they separated the Jews from the Christians and ordered the wearing of yellow stars on both the front and back. Most Jews had yellow circles instead of stars. Jews who talked to Christians were beaten. To intimidate the Jewish community, some were randomly hung, as these men were. In November 1941, the Jews were crowded into twenty-seven houses and a pigpen. Some 500 men lived in bunk beds with a single stove in the sty; the windows of the Ghetto were boarded up. The Jews were not allowed to leave the Ghetto. Unlike large ghettoes, Jewish police were not appointed. As the Red Army approached Velizh on January 18, 1942, The Germans set fire to the Ghetto with the Jews inside. Mothers threw their children out of windows into the path of German machine guns; only one survived as the gunners changed ammunition. Only twenty-five men survived the inferno in the pig sty, but hundreds of other Jews escaped to be liberated by the Red Army or join the partisans. The Soviet 4th Shock Army surrounded the German 257th Infantry Regiment, 83rd Infantry Division in Velizh on January 29, 1942. The Soviets were unable to capture the town despite penetrating the defenses several times and were forced to withdraw when a German relief column approached two weeks later. Partisans, supported by trained and equipped units of the Red Army, took a heavy toll on the Germans. In March 1942, 3rd Panzer Army reported "There are indications that the partisan movement is the region of Velikiye Luki, Vitebsk, Rudnya, Velizh is now being organized on a large scale. the fighting strength of the partisans hitherto active is being bolstered by individual units of the regular troops." The partisans made it difficult to resupply the garrison, but the Germans held Velizh until September 20, 1943. In 1942, a dead German was searched and several photos of the five men of Velizh were found. 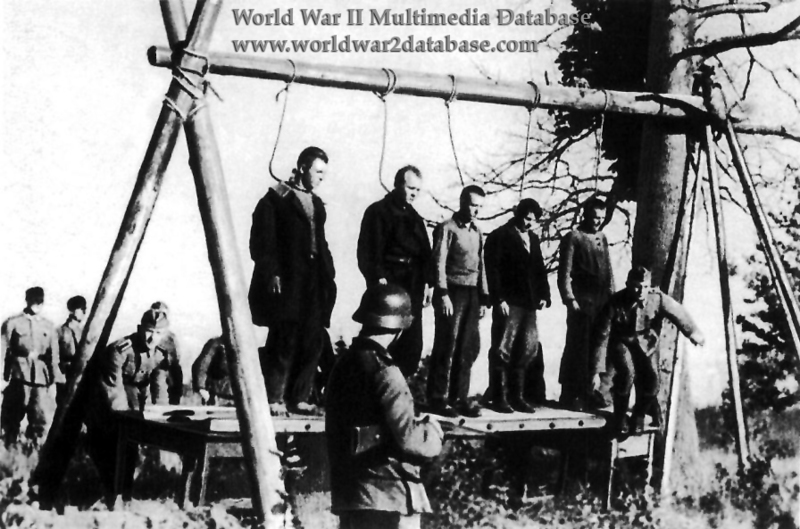 They demonstrated how German reprisals were undertaken - first, an improvised gallows was built and tested; then, the men are forced onto it and a rope is tied around their neck; then, the support is kicked away. The rest of the photos show the five dead men in wide views and close-up. A Soviet propaganda film was made about the "Five Men of Velizh" to encourage support of partisans and stir patriotic fervor. Five of the photos were included in the documentary. The film was given to the British, who had BBC announcer Wilfred Pickles (October 13, 1904-March 26, 1978) record an English narration. The film was widely disseminated in both the United Kingdom and the United States.